“We do our research and we want people to look twice at our arrangements. Right now I am using a lot of cabbages and artichokes in my designs-finding unique greenery, unusual combinations of flowers,” explained O’Brien. Think outside the box, er, the vase. That’s the advice of renowned Philly floral designer Donna O’Brien from Northern Liberties’ Beautiful Blooms. Beautiful Blooms is a full service décor design company that works with discriminating clients to create event concepts-from dream weddings, corporate events, bar/bat mitzvahs, intimate dinner parties and more. O’Brien’s bustling business was recently honored by The Knot as a Best of Weddings Winner 2010 as one of the best florists in Philadelphia. Holiday centerpieces and wreaths in 2009 don’t have to follow any rules according to O’Brien, who prides herself on setting trends and concepts within the international design industry. Beautiful Blooms Boutique has created several floral designs and custom cedar or pine wreaths (ideal for the corporate client/thank you) that can be purchased for the holidays or throughout the winter season. These designs can be picked up or delivered ($55 or over for delivery) in Philadelphia. Variegated white, red and peppermint poinsettias wrapped in chic metallic paper have been flying out the door, said Donna, for delivery to several Philly corporations for office décor and gifts. The talented team at Beautiful Blooms can also create custom arrangements throughout the year. “I love using different types of leaves in the centerpieces. Tulips are in season now, they come in season late fall with great colors and most people really do not think of them as a fall or winter flower. Tulips can be most unexpected but hearty and beautiful with fall and winter designs. With our containers, we are also trying to use different shapes and have the container as an accent to the arrangement,” explained O’Brien. This beautiful “cone” vase is a hand blown piece made by a local student artist. 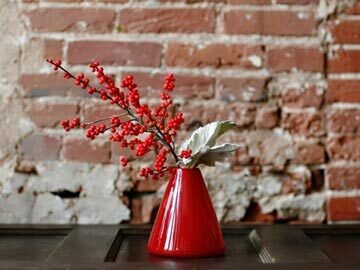 It is a beautiful gift item and complimented with red ilex berries and dusty miller. Beautiful Blooms is working with local artists to use their hand blown glass vases so the Blooms’ client also receives a beautiful one of a kind keepsake with their flowers. Popular local Etsian and glass designer Penelope Rakov is one of O’Brien’s celebrated artists (spoton.etsy.com). Her stunning, petite hand blown vases are available in O’Brien’s Northern Liberties retail location and are a perfect compliment with a romantic collection of flowers or sophisticated hostess gift. O’Brien and Kendall Brown of Eclatante Event Design, located in dual retail spaces at their NoLibs walkway, are available for private home and party planning for the holiday and winter season throughout the Delaware Valley. The duo has a growing Main Line clientele and will offer full party design consultation, custom holiday planning, corporate design and more. 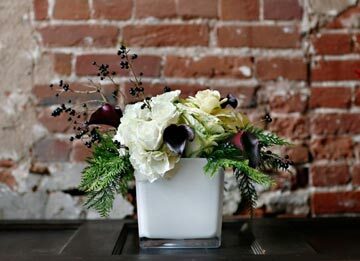 This arrangement is created in a white container with a mix of calla lilies, hydrangea, kale, privet berry, roses and accented with port orford cedar. In addition, O’Brien’s design workshops were such a success this fall that she will be carrying the concept into 2010. On Saturday, January 30th is a ‘Go Green’ Workshop from 11am to 2pm. “We really consider ourselves trend setters in the industry. The workshops are a great way to connect and pass on what we are learning and seeing with our clients. The monochromatic look is still strong in floral design-but a mix of textures is a key area-as well as incorporating unique elements. If a hostess needs one conversation piece, knockout centerpiece for the holiday season, we will be offering four or five different specialty items to order for the season,” explained O’Brien. Beautiful Blooms now has online ordering available too through their website, beautifulblooms.com. The woodland holiday theme remains hot this season. So, O’Brien recommends using fruits and nuts to decorate with your centerpiece. 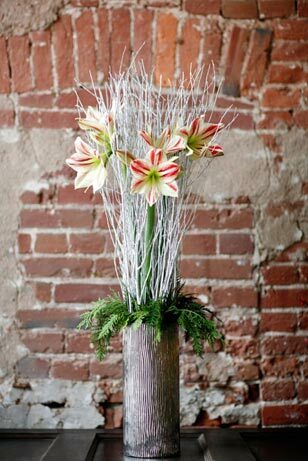 Beautiful Blooms recently did a design for a television segment where the whole arrangement was created this way. Flowers look great mixed with these non-floral elements from nature. Try arrangements that are allgreenery or have herbs mixed in. When in doubt, go with a monochromatic look. If you are not feeling so creative, sticking with one color scheme is always a safe bet, advises Donna. Instead of the expected clear vase, unique containers are fun-experiment with hand blown vases from local art galleries and neighborhood shops! Bring the outside in. Mix materials you have in your yard with fresh florals from Beautiful Blooms. For example, lay branches on the table and add small mix and match cups of flowers to enhance the look. Mix and match containers. Take things from your home such as gravy boats, teapots and pitchers and fill them with flowers-it can fun and eclectic! Vintage sugar bowls are super preppy. Floating flowers look romantic and are elegant and easy. Beautiful Blooms Boutique is located at 1021 North Third Street, Suite 201-301 in Northern Liberties. Visit beautifulblooms.com, email info@beautifulblooms.com or call 215-925-3111 to place a holiday order, schedule a corporate delivery in the city, or inquire about an upcoming wedding or event. Interested parties can also place an online order via beautifulblooms.com.